Cow slaughter nears long-term equilibrium. Has expansion stalled? Thus far, it appears beef producers have indeed reached somewhat of an equilibrium point in terms of cow inventory; growth is occurring, albeit at a very tepid rate. As such, it’s likely we’ll end up with a January 1, 2018, inventory very similar to 2017. In previous columns, Industry At A Glance has highlighted the importance of the beef cow slaughter rate to next year’s beef cow inventory. 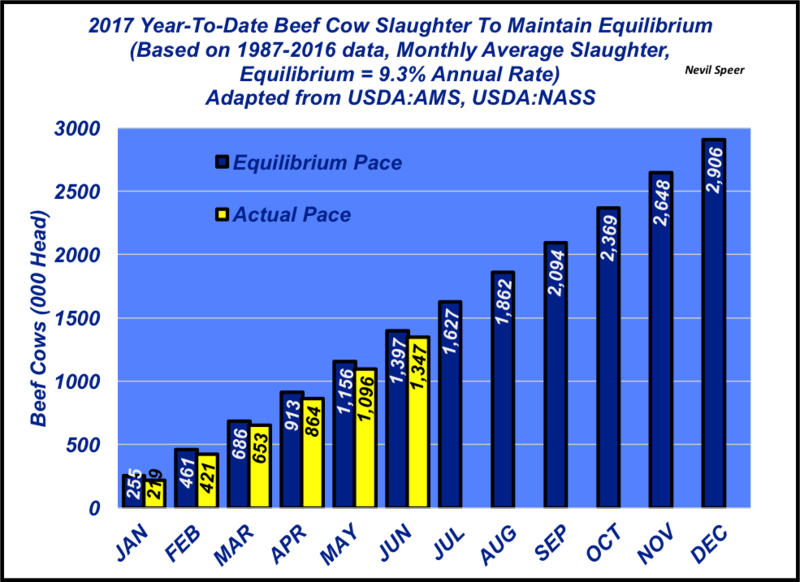 Based on data between 1987 and 2016, the equilibrium slaughter rate runs around 9.3%. In other words, bigger slaughter (as a percentage of the cowherd) means a smaller cowherd in the following year, while a rate slower than 9.3% spells likely expansion. The data are fairly reliable with only a few outliers (1993, 2015 and 2016). Within that analysis, it’s important to monitor slaughter rate on a quarterly basis. That enables us to look ahead to January 1 with some sense of certainty about net changes in cow inventory through the year. Accordingly, this week’s data reflect two items. First, the average monthly beef cow slaughter rate during the previous 30 years is applied to the 2017 starting inventory. For example, the average January slaughter rate in the previous 30 years has run right around 0.82%; applying that to the 2017 annual base equals about 255,000 beef cows. The annual total—2.91 million—is equivalent to 9.3%. Second, the data also reflect what’s actually occurred to date in 2017. Through the second quarter, beef producers have culled 1.347 million cows, compared with an expected, steady-state slaughter equaling 1.397 million head. Therefore, slaughter is running 50,000 cows behind the historical rate applied to 2017, or about 3.5%. Thus far, it appears beef producers have indeed reached somewhat of an equilibrium point in terms of cow inventory; growth is occurring, albeit at a very tepid rate. As such, it’s likely we’ll end up with a January 1, 2018 inventory very similar to 2017. What’s your plan for 2017 and fall cow slaughter? How do you perceive this trend playing out for the second half of the year? Leave your thoughts in the comment section below. Speer is based in Bowling Green, Ky., and serves as vice president of U.S. operations for AgriClear, Inc. – a wholly-owned subsidiary of TMX Group Limited. The views and opinions of the author expressed herein do not necessarily state or reflect those of the TMX Group Limited and Natural Gas Exchange Inc.